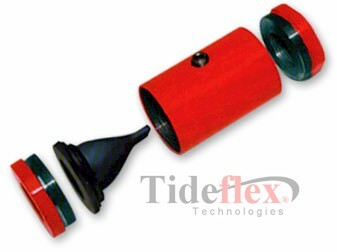 Manufactured on the same principle as the revolutionary all-rubber Tideflex Check Valve, the Series 2633 is a simple in-line check valve for threaded end pipelines. Simple in design, the Series 2633 consists of a body, two endcaps and the working element: the Tideflex elastomer check sleeve. In the open position, the sleeve creates a wide, free passage proportional to the flow in the pipeline. On flow reversal, the sleeve closes slowly and completely. The silent, non-slamming Series 2633 Check Valve design eliminates water hammer and facilitates low headloss. Containing no levers, packing, springs or interference fits to corrode or freeze, the valve is virtually maintenance-free. The only replacement part is the simple, rugged elastomer check sleeve. This small and simple in-line check valve is ideal for liquids, gases, powders, slurries and instrument or plant air, as well as in any environment where preventing back-flow is critical. The Series 2633 is manufactured in sizes 1/2″ to 3″ NPT. The check sleeve is available in a variety of elastomers to match specific service conditions.